NOTE: Date must be in the form YYYY-MM-DD, like 2019-02-09. Mitzi writes: As I continue to find keepsakes in Aunt Stella's collection, I discovered some of My Uncle Ed Waggener's writing from his early newspaper days, in the 1970s, I think. I wanted to share the one below after having found it today, February 9, 2019. I have long advocated an outdoor drama for Columbia. Edith Walker did write a skit, "Affair at Tucker's Station," which had plenty of action with Indian and early settlers battling, and it might could be expanded to compete with "The Stephen Foster Story" at Bardstown. But the most significant historical event here would probably center around Mark Twain. For a long time, I have believed that Mark Twain was conceived here. 2019-02-09 - Downtown Columbia, KY - Photo by Linda Waggener, ColumbiaMagazine.com. 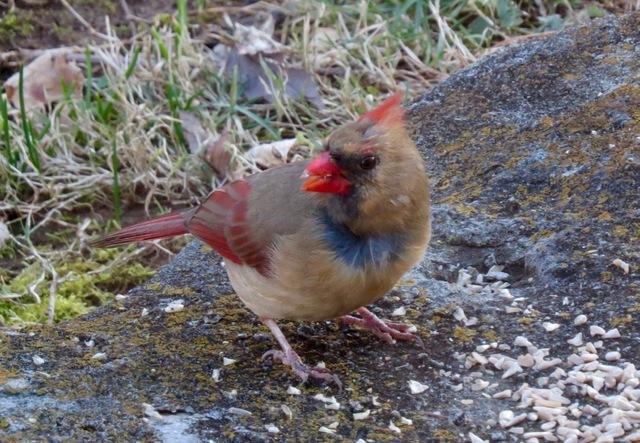 A Lady Cardinal stopped by the bird feeder for some sunflower seeds. She had to keep a lookout for Blue the Cat who is very brave when it comes to chasing after birds. Blue is not brave at all when another male cat or a dog races toward him and his cat food dish. At those times he slinks back to his shelf and waits. The staff of the Green River Animal Shelter (GRAS) says thank you to Mr. William P. Baas of Danville, KY for the donation to shelter in loving memory of Patty Wilson. We are sorry for the loss for her family and friends. She attended Egypt Christian Church and was a Certified Nursing Assistant at Westlake Regional Hospital for 30 years. She was an in-home caretaker after she left the hospital. Gay Morris, 77, of the Egypt community, died Friday, February 8, 2019 at Norton Women's & Children's Hospital in Louisville. Funeral services will be Sunday, February 10, 2019 at 2pmCT at Grissom-Martin Funeral Home with Jason Lacy officiating. Burial will follow in Grant Cemetery on Bull Run Road. Visitation is after 10amCT Sunday. She was a member of Bearwallow United Methodist Church, retired after 30 years at Lindsey Wilson College in the Cafeteria and she loved to quilt. Virginia C. Burton, 95, of Columbia, Kentucky, died Friday, February 8, 2019 at her home. Funeral services will be Monday, February 11, 2019 at 2pmCT at Grissom-Martin Funeral Home with Bro. Clifton Bennett officiating. Burial will follow in Haven Hill Cemetery. Visitation is after 11amCT Monday. Casket Bearers: Michael Burton, Allan Farris, Nick Burton, Colby Robertson, Blaine Harden, Bryce Farris, Tim Puckett. ACES Academic Team named District Governor's Cup Champs! The Adair County Fiscal Court will meet in Regular Session on Tuesday, February 12, 2019 at 6pmCT in the basement of the Adair County Annex Building basement, 424 Public Square, Columbia, KY. The Public is welcome to attend. Indictments brought against 6 individuals from Greensburg and Lebanon, KY, and Dayton, TN, on charges including wanton endangerment, disorderly conduct, theft, DUI, and speeding. Oris Wendell Spoon of Columbia, KY, died Friday, February 8, 2019 at T. J. Health Columbia. He was 76 years old. Funeral services will be 3pmCT on Sunday, February 10, 2019, at the Stotts-Phelps-McQueary Funeral Home, 210 Greensburg St., Columbia, KY, with Rev. Pat Smith officiating and Wendell's nephews serving as pallbearers. Burial will follow in the McClister Cemetery. Visitation is requested after 10:30amCT on Sunday at the funeral home. The Blue Raiders (0-1) were held scoreless in a game that would result in seven innings. The Lindsey Wilson wrestling team heads to the Newberry Open in Newberry, South Carolina on Saturday, February 9, 2019 at 8amCT. Lindsey Wilson wrestling (11-6, 5-2 MSC) returns to action after a 26-14 loss to No. 5 Cumberlands (Ky.) on Tuesday evening at Biggers Sports Center. This weekend's projected lineup for the Blue Raiders is Cameron Butler, Austin Deffenbaugh, Jacob Dodd, Bryce Hoffman, Johnny Lee, Lawrence Malala, Stiles Metcalf, Luis Puig, and Austin Ramsey. Billy Joe is spending the winter cataloguing some of the trees that keep the landscape green and beautiful while skies are grey and days are short. I know we are all enamored by the beauty of American Holly. There is proof in the sense that most experts proclaim that it is the most sought after natural green for Winter and holiday decorations. One thing we must address is that before planting American Holly one should realize that the species is dioecious; meaning that there are boy and girl trees. The beautiful and desirable red fruit is found only on the girl trees. Dwight D. Harris of Jamestown, KY passed away Friday, February 8th, at Russell County Hospital, Russell Springs, KY. He was 74 years old. A religious service will be held at Jamestown First Baptist Church, 165 W. Cumberland Ave., Jamestown, KY, at 10amCT on Monday, February 11, 2019, with Bro. Scott Russell officiating. Interment will follow at Jamestown Cemetery Jamestown, KY.
Friends may visit on Sunday, February 10, 2019, from 4pmCT until 8pmCT at Jamestown First Baptist Church. Campbellsville University is displaying pieces of art created by Suzanne Renfrow of Morgantown, KY through Thursday, February 14, 2019, at The Pence-Chowning Art Gallery, 205 University Drive, Campbellsville, Ky. There will be a reception at The Pence-Chowning Art Gallery on Thursday, February 14 from 3:30pmET until 5pmET. Everyone is invited to the exhibit and reception. Renfrow has been a potter for 20 years and owns a Pottery Studio in Morgantown where she creates her artwork and finds inspiration for new pieces. Renfrow spends many hours working in her pottery studio, fashioning pots in different styles and finding different ways to shape and design the pieces. those who have well worn. --Robert Stone, Saturday, 9 February 2019. The Lindsey Wilson women and men's basketball teams are continuing Mid-South Conference play on the road at Shawnee State (Ohio) on Saturday afternoon. The doubleheader action is scheduled to begin with the women's game at 1pmCT followed by the men's game at 3pmCT from Frank and Janis Waller Gymnasium, 940 2nd St, Portsmouth, OH. Frankfort, KY - People who are considered high risk for exposure to the Hepatitis A virus should get vaccinated as soon as possible to avoid contracting the virus and lessen the spread of the disease. High risk groups include individuals who use illicit drugs, close contacts of illicit drug users, and homeless people. The Department for Public Health (DPH) is making this recommendation as part of its efforts to respond to the ongoing outbreak of Hepatitis A. Since the outbreak began in August 2017, reported cases continue to rise and have now been recorded in 103 of Kentucky's 120 counties.